8 Projects to Crochet in Red, White, and Blue! Are you looking forward to the most patriotic of summer holidays? 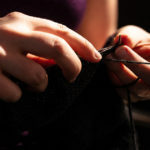 I definitely am—I love the Fourth of July, and I love figuring out how to incorporate crochet into all my favorite holidays! 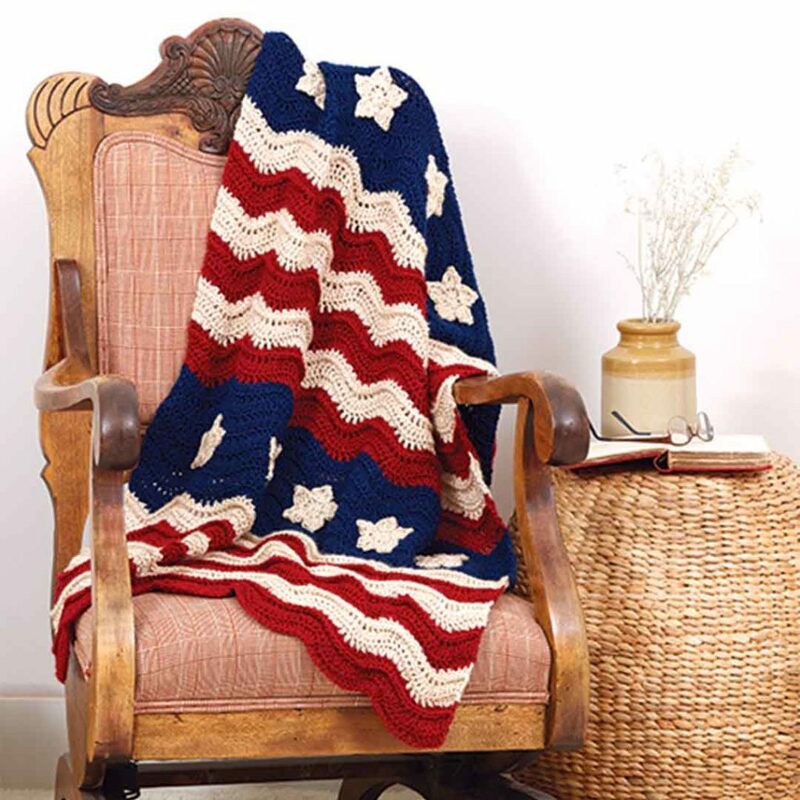 If you’re looking to add some crochet to your Independence Day, take a look at these crochet patterns worked in red, white, and blue. Start stitching this weekend and work up your favorite from this list just in time for the Fourth of July! 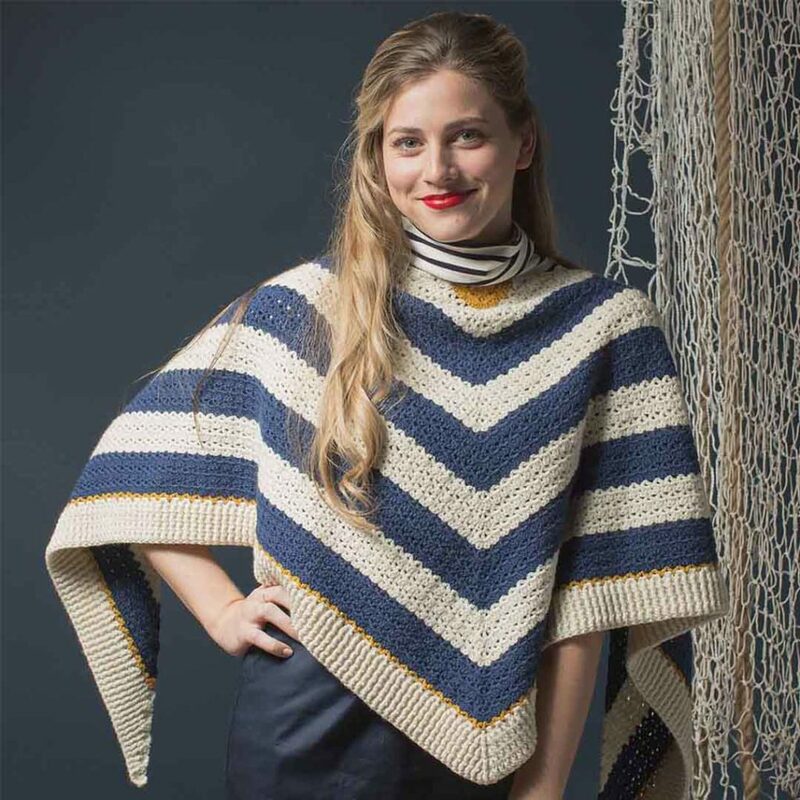 The Going Ashore Shawl from Interweave Crochet Summer 2018 is the project you need to wrap around your shoulders as you sit down to watch some fireworks. In our issue, it is worked in yellow, white, and blue, but red is an easy substitution. And if you want red, we have you covered; we’re selling the kit in festive patriotic colors! 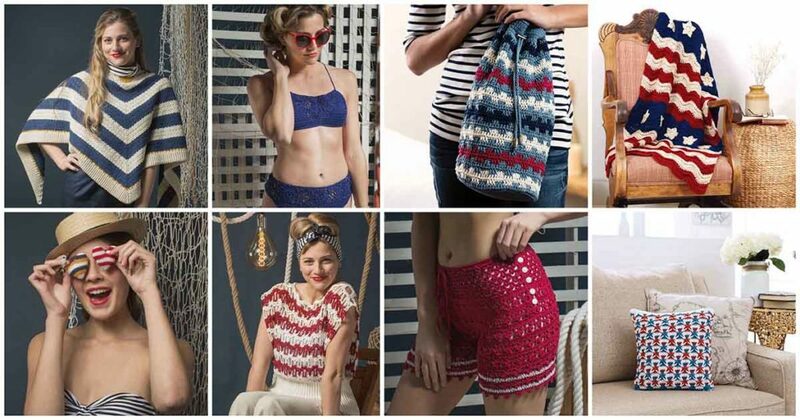 These adorable and vintage-inspired shorts from Interweave Crochet Summer 2018 are worked in red with white stripes. Pair them with a simple blue tank or tee and you are set for the holiday. With its beautiful red and white stripes, this lacy top from Interweave Crochet Summer 2018 stands out from the crowd. Mix up the color striping pattern by adding some blue, or simply pair this top with jean shorts or a navy blue bandana. Work up this adorable keychain quickly and add some patriotic flair to a bag, water bottle, or set of keys. The stripes are easy to customize, and the tiny project will have a big impact at your holiday BBQ. Find the pattern in Interweave Crochet Summer 2018. Everyone needs a good swimsuit for a day off in the middle of summer! It’s the perfect day to go to the lake or the beach, or to run through the sprinklers in your backyard. If you want to hop on the crochet swimsuit trend, try the Aquatic Swimsuit from Interweave Crochet Summer 2018. Bring out the stars and stripes! This fun-to-crochet chevron pattern uses post stitches to create the appearance of a waving flag; the star motifs are sewn on after you work the chevron pattern. Every Fourth of July party needs a Patriotic Waves Lapghan. 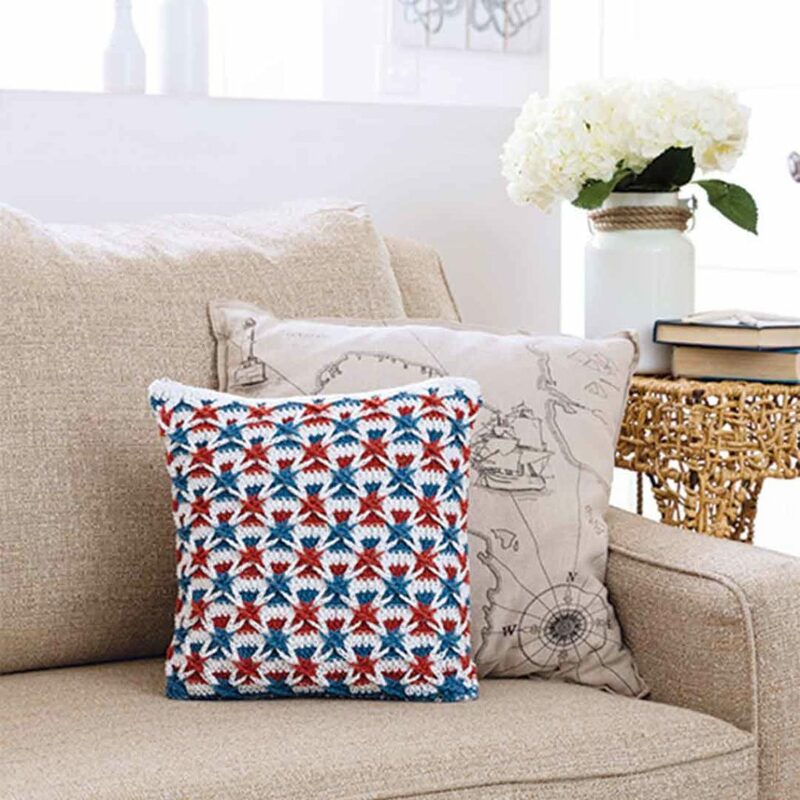 It’s hard to find a crochet pillow more unique than the Stars and Stripes Pillow! The project is worked in red, white, and blue stripes with sections of chain stitches. Then, after the pillow is crocheted, interlock the chain stitches to create stunning star shapes! Find the full tutorial in Love of Crochet Summer 2017. This fun bucket bag features red, white, and navy stripes on a light blue background. Pack it full of sunscreen, water, and sunglasses and head to the park or pool for your holiday in the sun. 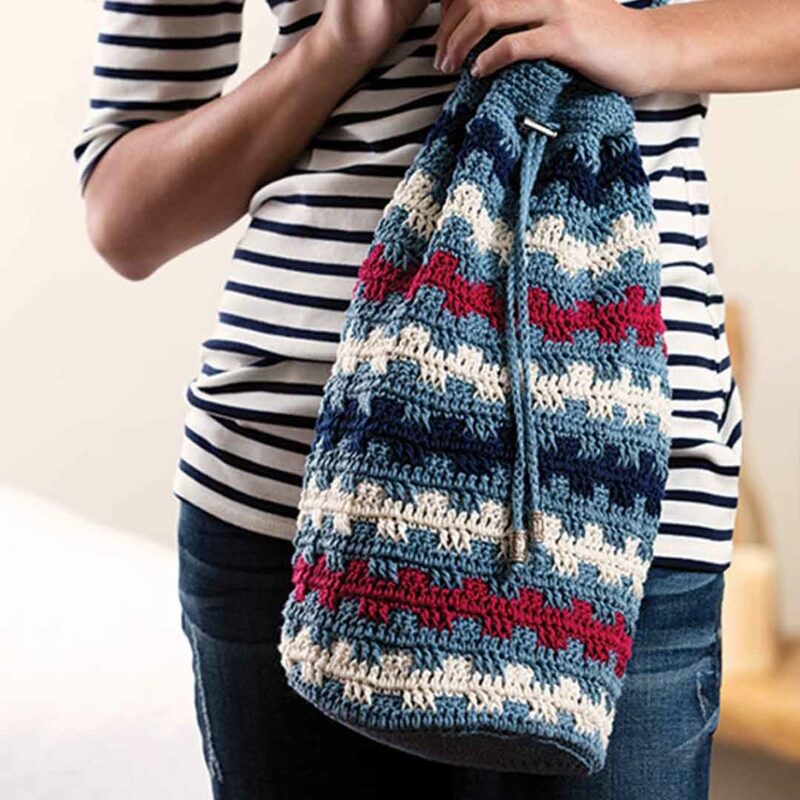 The Summer Shores Bag uses post stitches to play with color and texture, making this bag extra fun to crochet. Which red, white, and blue project are you most excited to create for the Fourth of July? Let us know in the comments below! Happy stitching, and happy Independence Day! Red white and blue projects for a festive Independence Day!